Our weekend look at some of the grandest brooches in royal jewelry boxes lands in Denmark today, where Queen Margrethe wears a magnificent diamond and pearl brooch that has been in Denmark's royal vaults for several generations. 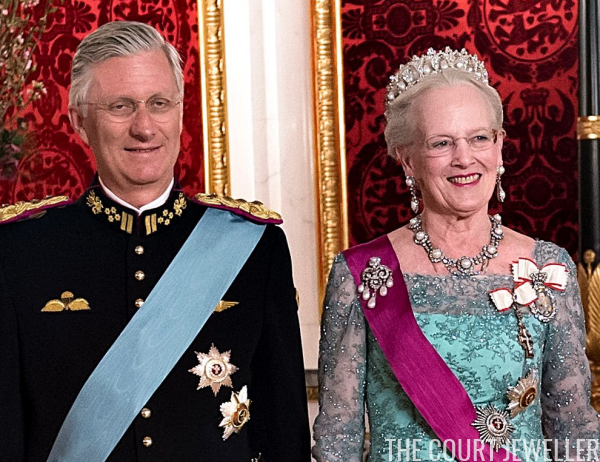 Here's how the diamond and pearl brooch that belonged to Queen Louise of Sweden ended up in Copenhagen. The brooch features a central diamond piece with scroll and floral elements, topped by a pearl and diamond button cluster. 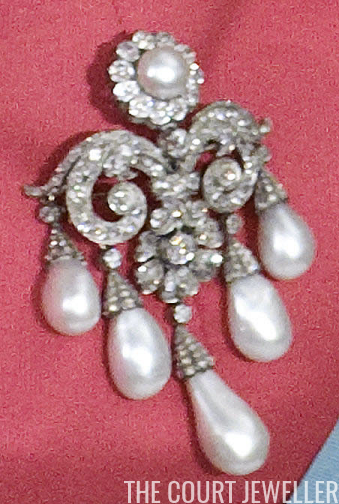 Five pear-shaped pearl pendants are suspended from the bottom of the brooch. In 1825, Princess Louise, daughter of King Friedrich Wilhelm III of Prussia, married Prince Frederick of the Netherlands. Among her wedding gifts was a pair of matched pearl and diamond jewels: a tiara with eighteen pear-shaped pearl pendants and the brooch we're discussing today. Because the bride was a Prussian princess, some have speculated that both the tiara and brooch may have been made in present-day Germany, perhaps in Berlin. (You can read a lengthy post about the tiara here.) Louise wore both the tiara and the brooch in the portrait above, which was painted by Jean-Baptiste van der Hulst in 1836. Princess Louise passed her diamond and pearl brooch along to her daughter, also named Louise. In 1849, the younger Louise married Crown Prince Carl of Sweden, and the couple eventually became King Carl XV and Queen Louise of Sweden and Norway. Queen Louise was depicted wearing the diamond and pearl brooch in the portrait above, which was painted by Amalia Lindegren. She also eventually inherited her mother's pearl drop tiara, but because very little time elapsed between their deaths, she never got to wear it. Instead, the tiara and brooch were passed along to Queen Louise's only surviving child, Princess Lovisa of Sweden. 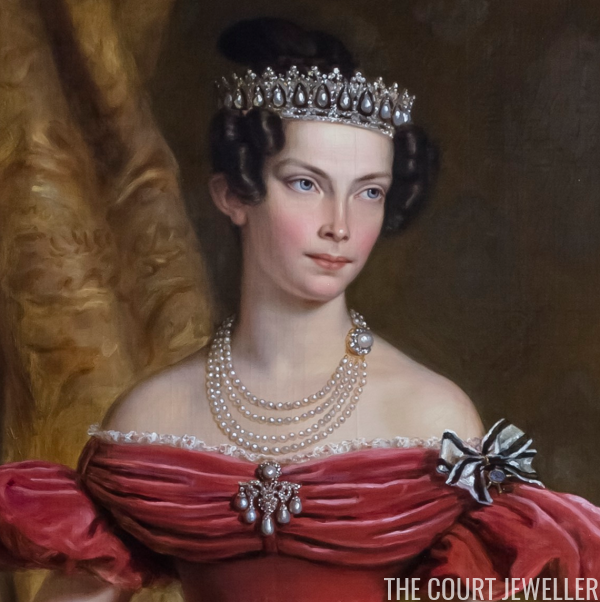 When Lovisa married Crown Prince Frederik of Denmark in 1869, she added additional pearl and diamond pieces to her personal collection, and she began wearing them all as a set (or a "married" parure, as the jewels coordinate, but were not made to match). Lovisa paired her mother's pearl drop brooch and tiara with a pearl and diamond necklace given to her by the Khedive of Egypt. (Part of that necklace was later repurposed to create a matching set of earrings.) A pearl and diamond double cluster brooch, a gift from her Russian in-laws, Tsar Alexander III of Russia and his wife, Maria Feodorovna, rounded out the set. Frederik and Lovisa became King Frederik VIII and Queen Lovisa of Denmark in 1906, and the pearl drop brooch graced the gowns of a queen consort once more. The set has become, in practice, reserved for the use of Denmark's queens. 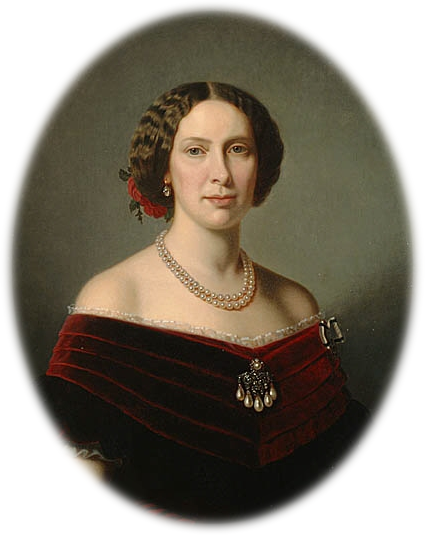 Lovisa eventually passed the jewels along to her daughter-in-law, Queen Alexandrine, who wore them occasionally. 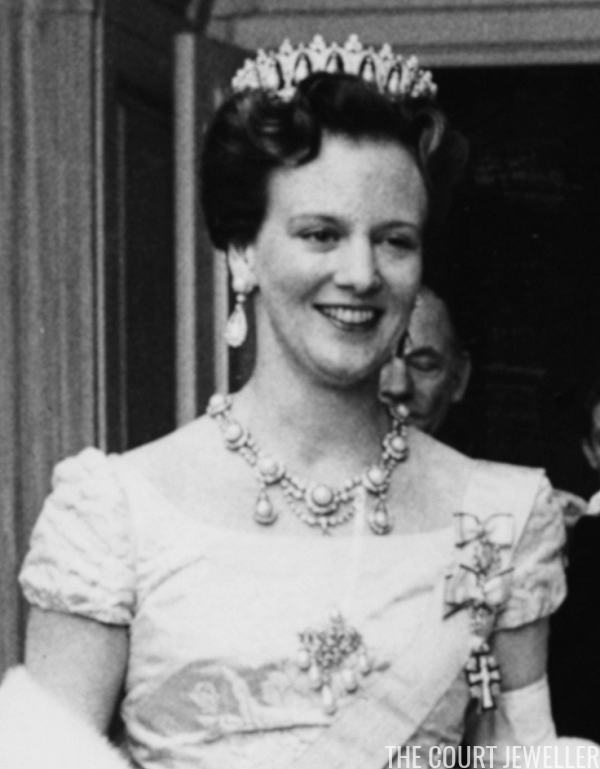 When Alexandrine's elder son became King Frederik IX in 1946, her daughter-in-law, Queen Ingrid, began wearing the pearl and diamond jewels, including the brooch. 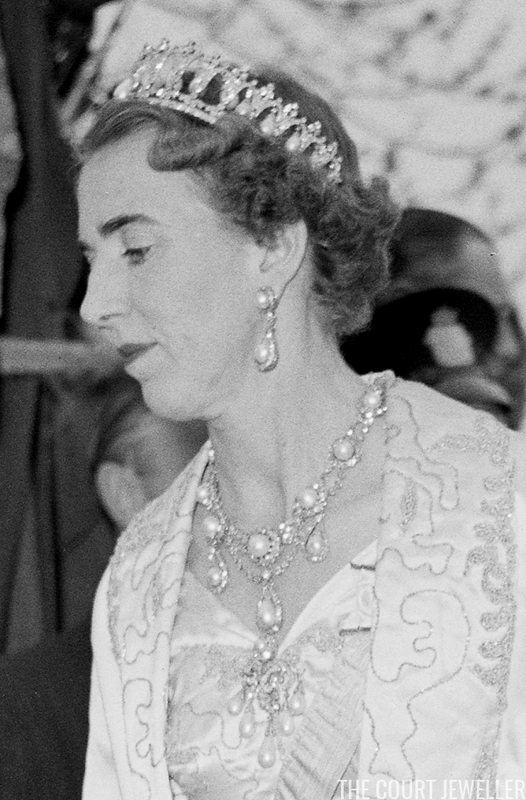 Above, Ingrid wears the pearl drop brooch pinned at the neckline of her gown at the wedding of Princess Ragnhild of Norway in May 1953. The brooch, along with the rest of the married parure, is now worn by Ingrid's daughter, Queen Margrethe II. Above, she wears the brooch and jewels at the very beginning of her reign, for a dinner given at Amalienborg for the diplomatic corps in May 1973. Margrethe has continued wearing the suite throughout her reign, often in the same configuration. You'll generally find the brooch pinned at the center of the neckline of her gowns, just as her mother wore it. Margrethe wore it in that position in June 2010 for one of the biggest royal events of a generation, the wedding of Crown Princess Victoria of Sweden in Stockholm. 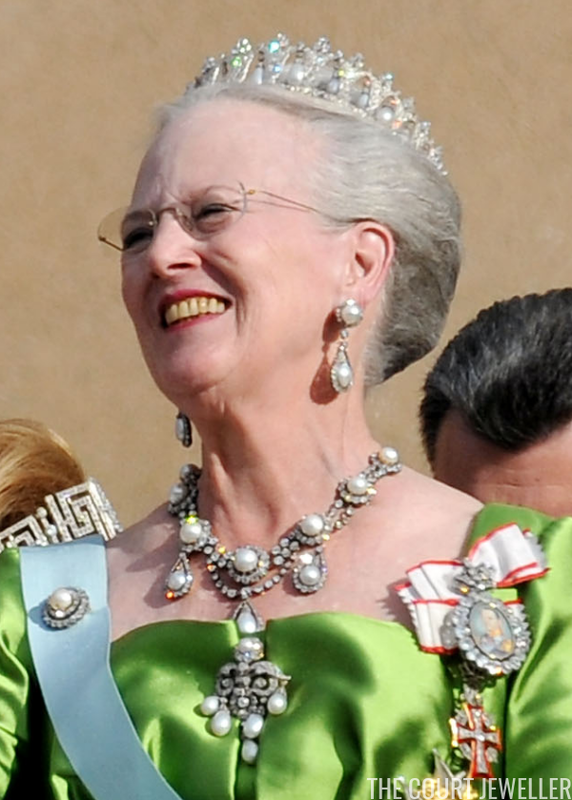 But you'll sometimes also see Margrethe wearing the brooch in other ways. 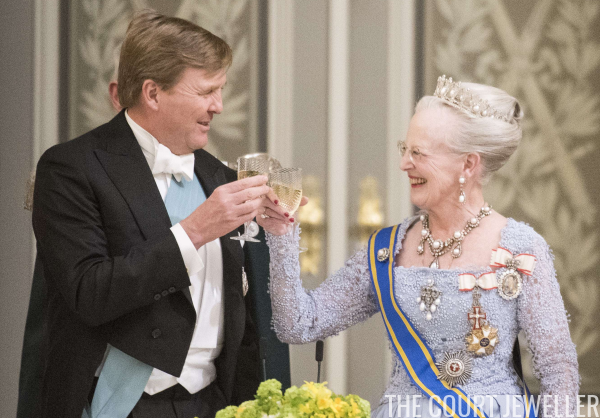 She has occasionally used it as the centerpiece of a pearl necklace, and for the Belgian state visit to Denmark in March 2017, she used it to secure the sash of the Order of Leopold. Princess Louise's brooch and tiara may not have been made to match all pieces of this married parure, but they continue to coordinate well with the rest of Queen Lovisa's wedding pearls today.